Strangely, this week’s volcanic eruption seems to be having more impact on people throughout the world than on people in Iceland — at least for now. REYKJAVIK, Iceland - Since the Eyjafjallajökull volcano erupted three days ago, an ominous cloud has formed above the glacier, a blanket of ash has settled over southeastern Iceland, glacial runoff is flooding the area, and delivery trucks have been stalled with 10,567 gallons of milk — at least that’s what we’re seeing on the news from Reykjavík. Given the international coverage of the eruption and the widespread effect it is having on travel in Europe and other parts of the world, people are wondering what’s happening here at the epicenter of it all. I’ve been getting messages from friends in the United States wondering if I’m OK, if everything is covered in ash, if the air quality is safe, and if I’m in danger of the floods. But the truth is, from Reykjavík, we not only can’t see the volcano, which is located about 85 miles east of us, but we have also been spared the ash, which is traveling southeast to northern Europe. Strangely, this eruption has had more impact on people throughout the world than on people in Iceland. Ash is falling as far as Milan and Icelanders only a few miles away are completely unaffected. In the south, a few small towns have been evacuated from the path of potential flooding, but the number of people affected pales in comparison to the number of people stranded all over Europe. The road between the towns of Hvolsvöllur and Skógar has been closed to the public, but it is still possible to drive necessary supplies across an old bridge. Farmers in the area are concerned that if the eruption keeps up, the ash could contaminate their animals' water supply, but otherwise the zone of impact is quite limited for the time being. Meanwhile, in Reykjavík, while people are glued to the news and there is a general awe over eruption’s worldwide impact, most people don’t seem overly worried about the impact the eruption could have here. But, as a friend of mine pointed out, that’s likely to change as soon as the ash starts blowing our way. There is an ever-popular saying here, “If you don’t like the weather, just wait five minutes.” If wind patterns change, the ash could very well start raining on us here in the greater Reykjavík area, which is home to about two-thirds of Iceland’s 320,000 residents. Of course, there is definitely a lot of uncertainty as to what’s going to happen next. Some are wondering whether the nearby and much larger volcano, Katla, will follow suit. Historically it has often followed Eyjafjallajokull eruptions within days or months. That’s not to say that people are actively living in fear. 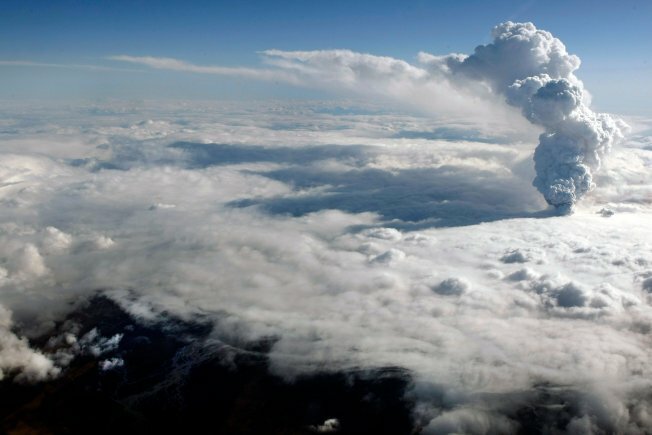 In fact, after the first eruption at Fimmvörðuháls, the Fox news coverage became a viral hit for what Icelanders deemed an overdramatized absurdity with the reporter predicting some kind of doomsday. The current eruption is admittedly more serious than the first one, but the same nonchalant attitude prevails in the city. I’ve heard people scoff at the “Support Iceland” Twitter twibbon campaign and jokes making light of the situation are flying every which way, especially given Iceland’s IceSave debt dispute with the Brits and the Dutch -- though I think I’ve heard the cash-ash mix-up joke ("You've heard about Gordon Brown? When he heard about Iceland he wanted cash, but there's no 'c' in the Icelandic language, so we gave him ash.") a few too many times. People have also been sending around this great photo of the eruption, which looks like a vicious man-eating monster emerging from the glacier. For some, the eruption seems to be a welcome diversion from the otherwise constant stream of news reporting on Iceland’s financial crisis. In fact, the volcano erupted the day after a 6,000-page investigative report into the October 2008 banking collapse was released. At least, Iceland’s crooks are likely happy to be out of the limelight. So, until south Iceland has been wiped out by floods, until we are forced to wear gas masks whenever we leave the house and until we have to dig our cars out of the ash, maybe Iceland’s concerned twitter friends should switch their “Support Iceland” twibbons to something like, “Support Stranded Travelers” because of all the people impacted by this eruption, I mostly feel sorry for them. Anna Andersen graduated from the University of California, Los Angeles in 2009 and currently lives in Reykjavik and attends the University of Iceland.